Joe Bruno and Doug Hortvet jumped onto the Indian. Roger had cut a new sprocket on the laser cutter and Gordon Harris machined the mount area to final shape, save for a small lip that would need grinding smooth. The clutch was being overhauled as well. The job ended up being left incomplete as the new clutch springs had not arrived yet. Terry and Jerrie Bledsoe spent a great deal of time prepping the grounds! 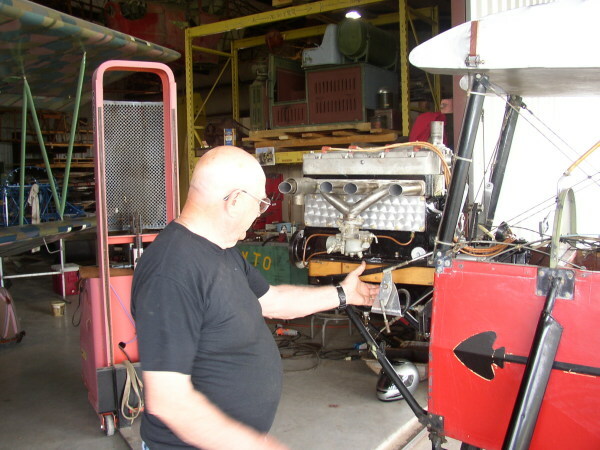 Terry also worked on the Fairchild, salvaging fittings and such to be sent off to the powder coaters! The Fairchild fuselage and many of the parts already sent out are back and looking very good!! The remaining volunteers swung into action on the Pietenpol - it was time to reinstall the engine. The little airplane was dug out of the hangar and trundled over to the shop apron. The wings were removed and stored back in the hangar. The engine was installed and parts were being reassembled and linkages connected when I had to leave. But nearly all the engine reinstallation work was completed. No prop, as Roger has loaned that out temporarily. Brian Kaminski and sone Daniel removed a bunch of debris from the radiator. Much of it was acorns, of all things! Bill Walsh dropped by and brought a collection of small scale model airplanes for the museum. In addition he brought his 1/32nd scale Junkers J.1 he'd recently received from a new manufacturer - Wingnut Wings. Check them out on the web, if you have not already! Fabulous stuff! Bill was present primarily to tour an architect he knows around the property. The architect had offered to review the draft proposals for the fund-raising effort to see whether anything material had been left out. Hopefully we'll see his opinion quickly.